I am what you might call a “City Slicker”. My people are supremely well-adapted to urban life. Need to find a great pizza? I’m your guy. Want to complain about parking? Ditto. Navigate a traffic circle? Sucka, please. I was not a Boy Scout, nor have I ever been “lost” in the sense of “only find-able by bears and mountain lions.” I am also not really tall or muscular, which are very handy physical attributes when you are crammed on a subway car during rush hour. As the door slammed and I heard the sound of tires squealing out of our neighborhood, the children stared at me expectantly. Firstborn Son is, unfortunately, too clever by half. Lovely Daughter is excited because now she has something to be excited about and it involves snacks. The Hurricane is just excited to be coming along on an “Ad-ven-ture!” with his big brothers and not getting left behind. Yipee! Two hours later, we’re ready to go, because kids. 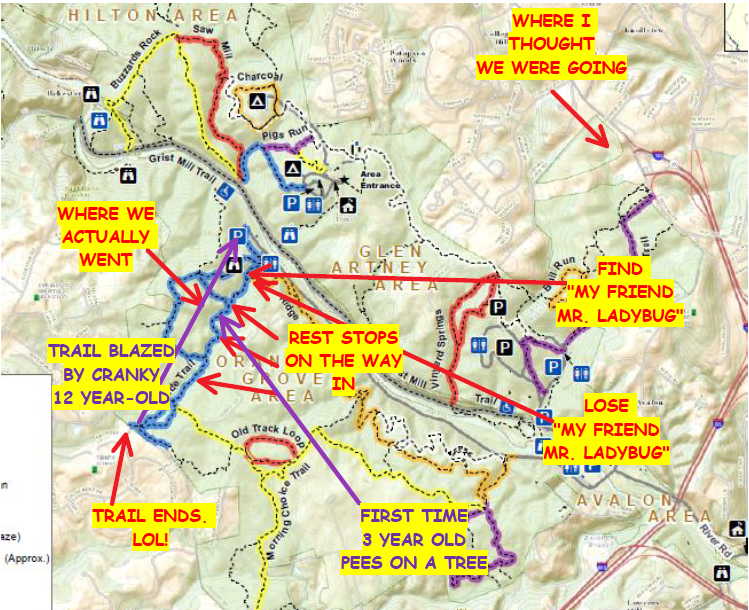 I checked the map on the web site and noted the name of the area we were trying to get to– it had “multiple stream crossings” which sounded perfect because it’s hot as balls outside. I loaded everyone up and take the very short drive to the State Park. I’ve lived in this area for almost forever… why haven’t I done this before? This was a great idea! I pulled up to the gate. “Hi, I’m looking for the Avalon area!” I was very pleased with myself for remembering. The ranger ducked back into his little hut and emerged with a sheet of paper. It hadn’t occurred to me that the park has more than once entrance. No problem! WE HAVE SNACKS! It’s okay, 1:30 and we were all a little hungry. We hit a picnic table and hunkered down to a delicious lunch of peanut butter and jelly, strawberries, and juice boxes. Except for Firstborn Son, who has decided that the only thing edible is the little pouch of potato chips. The kid who swims 15 miles a week is not eating. This was GIANT RED FLAG NUMBER ONE that I ignored. We cleaned up lunch and started up the “Cascade Trail” which sounded pretty and was probably the trail I remembered from the map. Despite having not eaten, Firstborn Son was bound and determined to hurry up and get this over with because he was in the middle of some kind of important quest, or level, or something computer-related and this wasn’t working for him, so he charged ahead. Like me, he’s well-adapted for urban life and allergic to the outdoors. Within only 10 minutes we hit what appeared to be the cascade bit, which was a short little waterfall into a shallow pool with some rocks around it. We stopped for a few minutes to take a break and climb on the rocks. The kids were having a great time clambering around on the rocks and wading in the water and at this point I was feeling Pretty Darn Smug. Our quiet time was soon shattered however, by a large group of moms and boys coming down the trail from the other direction. I felt a moment of pity for this poor mom. She was having a hard time dealing with her boys who seemed to be hell-bent on getting down into the water with us. 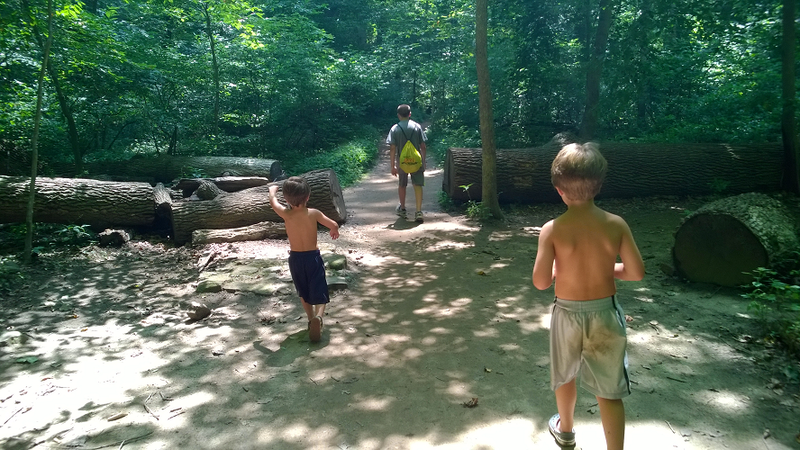 I looked at my kids who have chucked off their shoes and were poking around in the shallow pools and then up at her kids, who looked like the one thing they wanted more than ice cream was to go play in the water. If only she was Outdoorsy, Like Me. 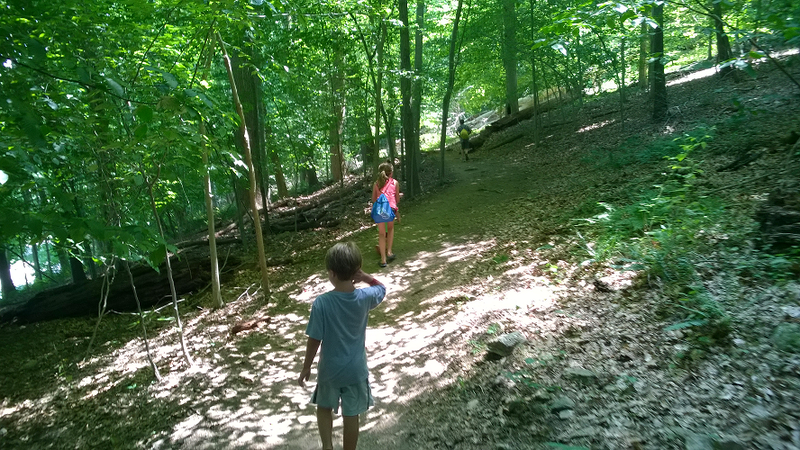 “Panic Mom” was killing my nature-induced serenity, so I told the kids to pack up and head up the trail. We headed a little way up the trail and somehow The Hurricane found a lady bug beetle, who was now His New Best Friend. “Look Daddy! It’s My Friend Mr. Ladybug!” Like most three year olds, he talks in initial caps. Have you ever seen a small child try to walk while holding something? It is the SLOWEST. THING. EVER. Our pace, which was at best one mile per hour was now measured in geological epochs. Mr. Ladybug wandered up and down his hands and arms and had his full and complete undivided attention. In a three year old this means there is no mental processing power available for tiny dude locomotion. Saddened though we all were by Mr. Ladybug’s untimely departure, we had to keep going because although I was fairly sure Firstborn Son had not fallen into a ravine, I had lost visual contact with him in his haste to Get This Over With. The trail was pretty easy and ran along a stream. 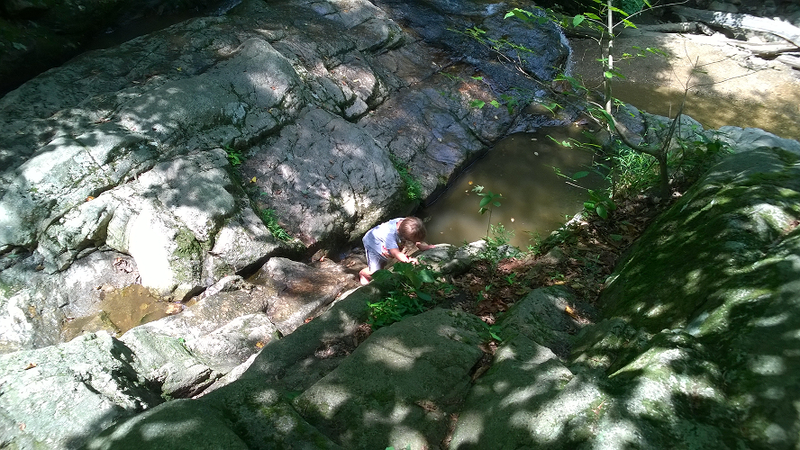 As we continued our walk every once in a while I had to fish out Captain Underpants from some part of the stream. He was now pretty thoroughly messy and happy. Lovely Daughter enjoyed hanging back with me and the Hurricane and talking my ear off. Aside from the continually worsening temper of my oldest, it was actually kind of pleasant! The trail opens up onto … a highway. Who the heck blazes a trail through a state park to a highway? By this time, the 3 year old had started to crash as well. We headed back into the woods a short way and found a spot to take a break. 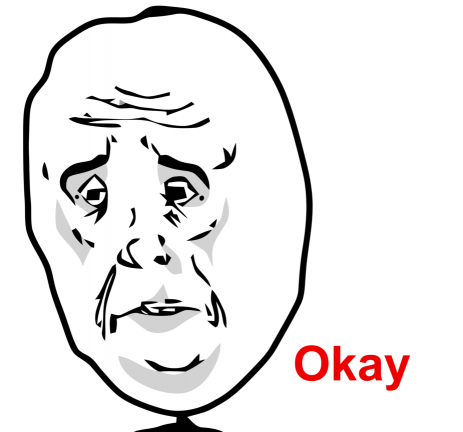 I fished out the leftovers from lunch out of my backpack and we all drank some water. Oldest Son has resigned himself to marching back to the car as quickly as possible. He drained his water bottle and half of mine while we’re sitting there. DING-DING-DING RED FLAG NUMBER THREE! The Hurricane slurped down a bag of strawberries and perked up a bit. Thus began The Long Trek Back. As we walked back, I was envious of Panic Mom. She was back at her car and probably not listening to her kids make a list of things she forgot to bring. Like sunscreen and bug spray and a golf cart with a cooler strapped on the back of it. Unfortunately, we didn’t run into Panic Mom, or Jackson, or Mr. Ladybug again, nor did we really do much on the way back besides try unsuccessfully to keep up with Firstborn Son. Captain Underpants is a little phobic about his siblings getting left behind. On the ride back Firstborn Son basked in the air conditioning for a bit in silence and then apologized for his behavior. HILARIOUS! And so realistic, as we sadly know from experience. Loved the post. Love it! “Stay away from 95, kids!” Hope you went for a snowball or soft ice cream after the pizza. Well *I* deserved ice cream, that’s for sure. And Daddy Juice. Lots of Daddy juice. lol. Someone always gets dysentery. Loved this! 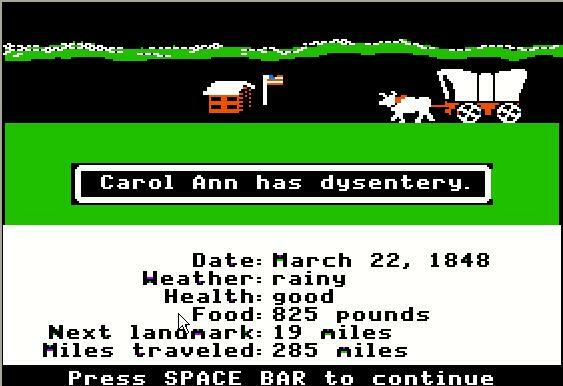 The way you started the post made me think of comedian Jim Gaffigan’s description of himself as “indoorsy!” I also got a kick out of the Oregon Trail reference and image. Enjoyed this post throughout; it was a fun read with great photos! Thanks! Jim Gaffigan has a very under-stated quality to his comedy– I hope I am not copying him too much, but I like his style.